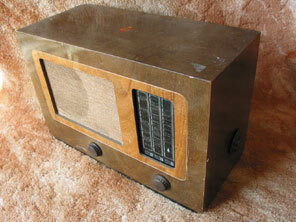 Bush Radio started trading in 1932. They were based at Sherperds Bush, London, and yes, the location of their first works provided the name of the company. It seemed obvious to use a bush as the logo for the company, and presumably the pot was added to avoid having to incorporate the tricky business of the soil or roots etc. Production only lasted four years at Sherperds Bush, and in 1936 the business moved to larger premises at Chiswick. Bush remained at Chiswick until 1948, when the principal works moved to Plymouth. Receivers built by Bush were generally very reliable, and the company used Christopher Stone, a familiar broadcaster of the 1930’s, to promote their sets. However I only have a couple of their sets in my collection, because the fact is they produced virtually no notably innovative receivers, either technically or cabinet wise. They did embrace features like pushbutton tuning (in say the PB63) of 1938, and also the teleflic tuning indication system, but none of it was really leading edge. The cabinets were pretty much always wood veneer boxes, with few interesting shapes (the exception being perhaps the AC3 “tombstone” with moulded decorative speaker fret from 1932). Its sad to report that many of their larger pre-war sets are bought simply just so that people can scavenge the PX4 output valves nowadays. 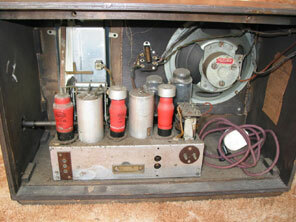 Shown above is the AC1 receiver from about 1947. It’s a 4 valve plus rectifier superhet receiver, and lets be totally honest here, it’s as plain as they come. Just take a look at the Murphy or Ekco pages elsewhere on this site to see what else was available in the late 1940’s, and you will see that it would be the conservative buyer who would have purchased the AC1. Yet only a year or so later they would produce probably the single most collected radio of the 1950’s, the DAC90, pictures of which can be found on the next page. Valve line up of the AC1 is CCH35, EF39, EBC33, CL33, CY31. The set cost £21.0.0 and was promoted with the Bush innovation of "Bush Bi-Focal Tone". The fancy words may have persuaded some people to buy, but in reality "Bi-Focal Tone" was negative feedback!